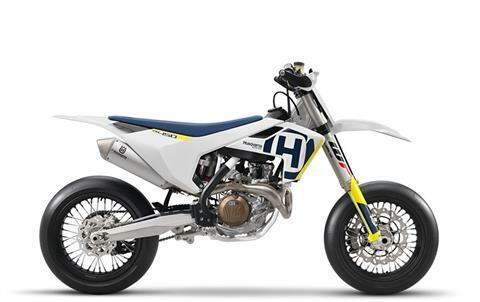 The ground-breaking chassis is fitted with the most powerful Husqvarna 450 Supermoto engine ever developed. The 63 horsepower single-overhead-cam 450 cc power plant is designed for optimal mass-centralization within the chromoly steel frame. The functional bodywork elevates the riding experience thanks to accurately developed ergonomics that focus on instilling rider confidence, complete control and reduced fatigue. POWERFUL ENGINE: The SOHC engine is the perfect example of the advanced engineering techniques used by Husqvarna Motorcycles. With a peak power of 63 hp and an overall weight of 27.8kg, the 450cc powerplant is not only powerful but also compact. Mass-centralisation is key in the engine design, enabling chassis engineers to benefit from greatly improved handling and manoeuvrability. Additionally, the multifunctional counter balancer shaft significantly reduces vibration while also driving the water pump and timing chain. COMPACT GEARBOX: The lightweight 5-speed gearbox incorporates a low-friction coating on the shifting fork guaranteeing smooth and precise shifting while the gear lever features a clever design that prevents dirt build-up and keeps the lever tip in its original position ensuring perfect control. The gearbox also features an advanced gear sensor which selects specific engine maps for each gear and allows the engine to distribute the ideal power delivery. CHROMOLY STEEL FRAME: The hydro-formed, laser-cut, and robot-welded frame expertly crafted by WP Performance Systems has been designed with calculated parameters of longitudinal and torsional flex. New aluminium head stays provide more efficient engine mounting while retaining a light, compact and strong package. The frame is finished off with a premium white powder coating and standard frame protectors guaranteeing supreme protection and durability. CARBON FIBRE SUBFRAME: The composite subframe is a design unique to Husqvarna motorcycles showcasing pioneering technologies and innovation. This 3 piece component is made up of 30% carbon fibre making it remarkably light (1.4 kg) and strong. Specific care has been taken to create a certain rigidity for optimal handling and rider ergonomics. CRANKSHAFT: The inertia produced by the crankshaft is carefully calculated to deliver optimal traction and ride-ability from the powerful 450cc plant. The component is positioned to harness the rotating mass in the ideal centre of gravity resulting in lightweight and agile handling. A plain big end bearing comprising of two force-fitted bearing shells ensure maximum reliability and durability, guaranteeing long service intervals of 100 hours. CNC MACHINED TRIPLE CLAMPS: The CNC machined triple clamps incorporate precisely engineered parameters that allows the fork tubes to flex under stress. This gives the rider more feeling under braking. They are designed to evenly distribute the clamping force on the fork leg, maximizing contact area for optimal sensitivity and minimum friction. MAGURA HYDRAULIC CLUTCH: The high quality German-made clutch system guarantees even wear, almost maintenance-free operation and perfect modulation in every condition. This means that play is constantly compensated so that the pressure point and function of the clutch remain identical in cold or hot conditions, as well as over time. SUTER ANTI-HOPPING CLUTCH: The SUTER anti-hopping clutch prevents rear wheel instability and hopping when braking hard into the apex of a turn, for maximum control and perfect supermoto-style drifting. FUNCTIONAL BODYWORK: Modern and functional bodywork with traditional Husqvarna blue and yellow accents mark a simplistic yet stylish Swedish design. The ergonomics are tailored to deliver greater control and comfort, enabling riders to perform at the highest level for extended periods of time. The seat has a low-profile and a high-grip cover for superior comfort and control in all conditions. WP SUSPENSION: The 48-mm split air fork features a capsuled air spring and pressurised oil chamber for progressive and consistent damping. The component is easily adjustable via a single air pressure valve for pre-load (on the left leg) and easy access clickers adjusting damping with 30 clicks (on the right leg). Additionally, the air pump needed to adjust air pressure in the fork is provided as standard. The high performance rear shock made by WP features 266 mm travel and is adjustable in rebound and high/low speed compression, guaranteeing excellent stability and world class damping. BRAKES: Exceptional stopping power guaranteed by Brembo brakes, featuring a 4-piston radially mounted calliper and pump in combination with a 310 mm disc at the front. A single piston calliper and a 220-mm disc are fitted to the rear. The perfectly placed controls allow for optimal feel and balance under extreme conditions. WHEELS AND TYRES: Alpina spoked wheels on the front and rear respectively, are lightweight and strong. They are complemented by Bridgestone 125/80 R420 and 165/65 R420 slick tyres for maximum grip, traction, and agility. MAP SWITCH: Optimised for easy operation, the new map switch can change between two engine maps, activate launch control and operate a new traction control feature. With the engine at idle, launch control is engaged by switching once between the selected map and the alternative map, and then back again. When the fuel injection LED flashes, launch control is engaged. This function limits the amount of power to the rear wheel, improving traction and preventing loss of control under hard acceleration. Traction control can be selected to an on or off position from the switch and functions by analysing throttle input from the rider and the rate at which RPM increases in the engine. If the RPM increases too quickly, the EMS registers a loss of grip and reduces the amount of power to the rear wheel ensuring maximum traction. ENGINE MANAGEMENT SYSTEM: The Keihin EMS is designed to be smaller, lighter, and faster at processing data. It integrates launch control for perfect starts, selectable engine maps via the switch on the handlebar and traction control. Combined with the new gear sensor, power delivery is tailored for each gear. 44 MM THROTTLE BODY: The MY17 features the same 44 mm Keihin throttle body as MY 16. The injector is precisely positioned to ensure the most efficient flow of fuel into the combustion chamber. To ensure optimal throttle response, the throttle cable is mounted directly without a throttle linkage providing more immediate throttle response and feeling. ELECTRIC START AND LI-LON BATTERY: The FS 450 features an electric starting system which uses a compact Li-Ion battery which is 1 kg lighter than a conventional battery. The wiring harness is designed so that the rear subframe can be removed without having to remove any wiring. Without Fuel - 231.04 lb.